Presumably, too, Sajjan needs to rebrand and recycle the “threat” narrative, and the “NATO are the good guys” meme, so he is now reintroducing Russia as a threat. Corporate media presstitutes, naturally, are all too willing to go along for the ride, even though reality and solid evidence contradicts the Western narrative. The “Russia is a threat” narrative may have legs though, since any government that actually opposes terrorism is a perfect scapegoat for Empire: Libya, Iraq, Syria, and the Ukraine all successfully opposed terrorism before being attacked by NATO and its terrorist proxies. When Russia bombs ISIS positions in Syria, ISIS territory actually decreases, and towns are liberated, as might be expected. When the U.S “bombs ISIS” in Syria, on the other hand, ISIS territory increases, thus revealing barely disguised neo-con ambitions, and exposing the Big Lie. The re-invigorated “Russia is a threat” meme contradicts all solid evidence about the Ukraine, just as it contradicts all the lies about Syria, and President Assad. 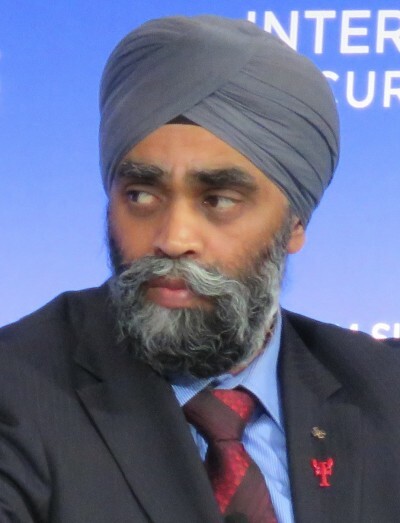 Either Sajjan is totally ignorant of Ukraine’s recent history – which is possible — or he is lying about the Ukraine as well. A video by St. Pete’s for Peace graphically uncloaks the lies perpetrated by NATO warmongers and their presstitute accomplices. Crimea, home to Russia’s Black Sea Naval Base – and likely the real target of the coup — exercised its right to self-determination on March 16, 2014, by way of voting in a referendum and opting for independence from the neo-Nazi infested, illegal Kiev government. Russia did not invade or “annex” the peninsula. Western protestations to the contrary ring hollow. What Washington has made completely obvious is that “self-determination” is a weapon used by Washington in behalf of its agenda. If self-determination advances Washington’s agenda, Washington is for it. If self-determination does not advance Washington’s agenda, Washington is against it. Washington claims, falsely, that the referendum cannot be valid unless the entire population of Ukraine votes and agrees with the decision by Crimeans. Note that when Washington stole Kosovo from Serbia, Washington did not let Serbians vote,” and that, “Under the logic of Washington’s UN resolution, large parts of Ukraine are not legitimately part of Ukraine. They have remained parts of Russia, because Russians were not allowed to vote on their transfer to Ukraine. Thus, there is no issue about ‘Russia annexing Crimea,’ because, according to Washington’s logic, Crimea is still a part of Russia. What would happen if the roles were reversed and Russia was trying to impose its military will on land occupied by a NATO military base? What would happen if Russia placed its missile systems close to the U.S border? NATO, with its missiles, and its military bases, and its proxy wars, are a threat to Russia, and to all of us. Russia is not the threat. For the sake of peace and sanity, Canada’s government needs to reacquaint itself with recent historical records, and it needs to reduce, or totally reject its NATO “commitments”. We are supposed to be a sovereign, self-determining, peaceful nation. Our foreign policy demonstrates otherwise.